FIFA 19 is a sports video game that simulates association football. The game features 52 fully licensed stadiums from 12 countries, including new stadiums, plus 30 generic fields equals to a total of 82. All 20 Premier League stadiums are represented in the series. Commentary is once again provided by Martin Tyler, Alan Smith, Alan McInally, Geoff Shreeves, Clive Tyldesley, Ron Atkinson and Andy Townsend. FIFA 19 Ultimate Team Icons, the new version of what has previously been called Legends is playable on the PS4, Xbox One and PC versions of the game. Diego Maradona was added as a legend to the Ultimate Team, joining Brazilian stars Pelé and Ronaldo, Russian goalkeeper Lev Yashin and French star Thierry Henry for the 95-rated card. 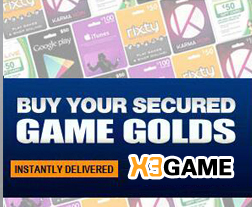 X3Game offers Fifa 19 Coins to each person, we has cheap prices and fast delivery of our products. Our ninety percentage customers got our products in 10 mins after their sucessfully purchasing. According our 10 years sales experience, our Fifa Coins source is very reliable, our transaction is very safe too, so please just buy it no hesitate and no worry.